Summer is not yet over, and we still have time for some more barbecue parties, poolside grills and picnics in the park. One brand that was oftentimes the star of the weekend barbecue parties we attended was Weber grills, and we’re really not surprised. 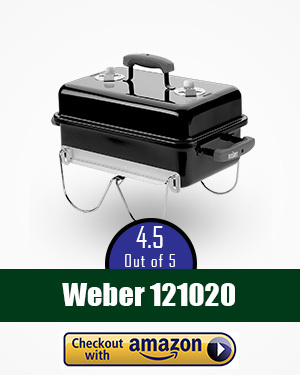 Weber has been manufacturing fantastic grills of every kind for over sixty years. We have personally been using the Smokey Joe model for several years now, and we were very pleased with its performance. So, we decided to check out some of the other grill types for some testing. We wanted to see which one would come out as our top choice in each grill category. We did our homework: compared features and functions, researched on the specifications of each of the Weber products we came across, and considered user reviews to come up with this list of our favorite Weber Grills that passed our test with flying colors. This grill is missing some hardware elements, and isn’t the most portable choice, as there are no wheels, however it is a great smoker to cook on for beginners that you can’t go wrong with. The Smokey Mountain Bullet smoker is a portable cooker that’s great for beginners or experienced users alike. Don’t be fooled by its small size, it has 286 square inches of cooking area where you can happily smoke two pork butts at the same time. You can easily invite your family and some friends for a barbecue party using this Smokey Mountain cooker. Added features include a charcoal chamber and water pan that are porcelain-enameled for added durability and easy cleaning, a built-in lid thermometer, and a grommet that lets you check your meat’s temperature without having to open the cooker lid. Aside from that, it comes in three sizes, all of which are affordable for a smoker/cooker this good. This model is simple to use and move around, and also comes in at a great value price. You can’t cook loads on it, but it has a good warranty and will last you a long time. This Smokey Joe has been to a lot of camping and outdoor picnic and beach trips with us, simply because of its great portability and size. The 14” grill is lightweight enough to take with you anywhere you feel like grilling burgers and steaks. It can cook six burgers or three steaks on its 147 square inch cooking area. It is also rust resistant with its porcelain-enameled lid and bowl, and charcoal grate made of steel. This package comes with an easy-to-read digital thermometer to make sure your steak doesn’t get over-done. Plus, it is affordably priced at only $40 with a warranty of ten years. Now, that is indeed great value for your money! This cooker is small and really easy to use. Whats more, it comes already assembled for you. Some bits are missing, like the portable stand, but overall this is a good model. Buy it from Amazon! ($199.00) Prices are accurate as of 23 Apr 2019 at 11:41 PM . Product Prices and availability are subject to change. Any price and availability information displayed on Amazon at the time of purchase will apply to the purchase of any products. When it comes to gas, the Weber Q1200 is a great option. This table-top grill boasts of a compact size with dimensions of 24.6” H x 40.9” W x 20.5” D. Its easy click electronic ignition is definitely an advantage, plus it has fold-out side tables for added workspace. 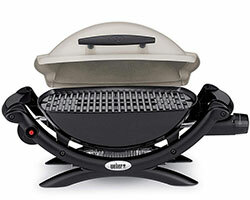 Another advantage of this grill is that it reaches you completely assembled and ready to use. It uses disposable LP cylinders, and is also compatible with the standard 20 LP tank with the use of an additional adaptor hose. The best part about this Weber grill is that this product comes in a variety of colors for you to choose from. This is good news for those who like to coordinate colors in their barbecue area. Best of all, it comes at a reasonable price point at around $200, still in the avg. 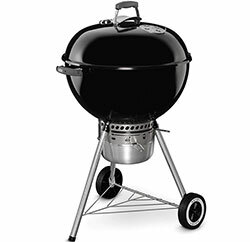 range of gas grills/smokers of the similar features and size. Buy it from Amazon! ($165.00) Prices are accurate as of 23 Apr 2019 at 11:41 PM . Product Prices and availability are subject to change. Any price and availability information displayed on Amazon at the time of purchase will apply to the purchase of any products. The classic Kettle style Weber grill is still one of the best, if not the best, charcoal grills there is! This grill is versatile in that it can be utilized both for grilling and smoking, if you know how to do it. Both its bowl & lid are made of porcelain-enamel, and the steel grates are hinged for your convenience. The 22” model boasts of 363 sq inch. of cooking space, which is enough to cook for a small party of friends and family. Another cool feature of this classic cooker is the removable ash collector at the bottom which makes cleaning simple and easy. A thermometer(built-in) on the lid also lets you keep track of your cooking temperature easily and accurately. It is also easy to set up and transfer from place to place with its stand and two wheels. Everything about this grill is simply designed for your convenience, which is why we really love it. We are almost halfway through the summer of 2018, and many (if not most) of us have one thing on our mind: weekends and barbeque! While many of us grill our meals year ‘round, there is just something about doing it during the summer months. The smell of charcoal, even in the winter months, brings us back to poolside gatherings, reunions in the park and all the fun that is summer! Weber smokers and grills are synonymous with summer and a quality grilling experience! After all, Weber smokers and grills have been around over sixty years, so is it any wonder that when folks think of grills, they think of Weber? Weber makes enough models (gas, electric, charcoal and portable) that anyone can find a smoker/grill that will fit their needs. 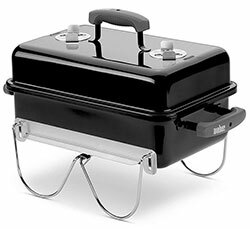 Some years back we purchased a portable Smokey Joe model that we brought with us every Saturday night to our trackside spot at the local racetrack for use during two racing-seasons. Everything we cooked on our little Smokey Joe came out terrific, from meager weenies, to burgers and kabobs, to hot wings! Is it any wonder that Grills Forever would want to do a comprehensive review of Weber smokers and grills? We didn’t think so, either. Here, at Grills Forever, we have been running methodical product research for the past five years because we want to help you find the best product(s) for your needs. We arrive at our conclusions after over 72 hours of research, involving several people in the process. This eliminates subjective and/or biased reviews. We also take the time to review different brands of the same product, which helps you understand that we aren’t biased or geared toward trying to promote a specific brand. To be completely transparent, we’ve reviewed this brand and over 34 products before we narrowed them down to the best 17 out of all of them. Then we narrowed our picks down to the top ten and ranked them in order. We carefully selected the products that can benefit a variety of users, from the casual home user to the professional griller. No matter who you are? We want these reviews to be helpful to you. After all, that’s what we are here for. A good grill is an investment, and nobody wants to experience buyer’s remorse! Gas: Many people prefer the no fuss-no muss simplicity of gas grills, and Weber grills do not disappoint. As you can see, below, they have four gas grill series, so even the pickiest of gas grillers will find something to love! Charcoal: Ahhh, the smell of a charcoal grill! As mentioned above, that smell, alone, invokes happy memories of summer days. Because Weber smokers and grills aren’t a “one trick pony,” they deliver a lot of choices for the traditional charcoal griller! Electric Grills: For grill enthusiasts in urban areas where a charcoal or gas grill may not be an option? As long as there is an outlet? There’s a grilling experience to be had! Portable Grills: Anyone that travels and wants their favorites fresh off the grill will want any one of Weber’s portable grills! What a terrific option for the beach, the park, or camping. As you can see, there is a make and model for everyone! First and foremost, you’ll want to decide which fuel source you want to use. This will be a determining factor in what your grill is made of. It’s also very important in the taste of your finished product, from hot dogs to that top of the line steak we all crave every now and again. Charcoal comes in briquettes (both plain and pre-soaked in lighter fluid) and can leave a chemical “taste” on what you’re grilling, but using a chimney starter can eliminate this, or allowing your briquettes to burn down enough that any chemical flavor will be burned off. There is also the lesser-known hardwood lump charcoal, which gives you the option of matching the flavor of the wood type to the type of meat you are grilling. Woods like hickory and mesquite might not suit your turkey or fish, but will pair really well with beef and other red meats (like ostrich, believe it or not). Gas and electric grills will deliver a great result, but you will sacrifice some of the flavors that you would get with either of the charcoal options mentioned above. There is a work-around, however, that will help you not sacrifice flavor for ease of use; wood pellets. These little gems can be used with all grills, and don’t need to be soaked like their cousins, the wood chips. The fuel you use is absolutely a personal preference, but please don’t think that gas and electric grills will sentence you to a life of less than tasty meals coming off of your grill! Are you primarily cooking for an intimate group of two to four people, or are you cooking for the entire family reunion on the regular? Cooking space is also something you will want to take into consideration, and Weber smokers and grills have a solution to whoever your culinary audience is. We’ll address this more a little later. Getting to and maintaining your ideal temperature varies as much as the choices in fuel! If you’re working with charcoal, use that chimney starter and when the coals are ready, put them under your grilling surface, ensuring that they get enough oxygen to keep them hot; that means keeping some of your lower vents open. If you’re grilling with gas, this may be easier. Simply set the temperature much like you would your oven and run with it for better flavor. With electric grills, you will benefit from a grill thermometer. You’ll pre-heat the grill on the highest setting and go from there, using your thermometer as your guide. The larger the ash-catcher, the larger the amount of charcoal you can use. A tiny ash-catcher won’t accommodate the grilling of several trays of wings, for example. This should be common knowledge for any item purchased; get the best warranty that you can. Let’s just say that the Weber Smoker/Grill warranty is one of the most generous out there. To say that we were impressed is kind of an understatement. Weber’s Spirit II, Genesis II and Summit warranties are top-notch! All three boast an “all parts” warranty of ten years. TEN YEARS! We can’t tell you when we’ve had a grill last that long, so that, alone, gives Weber smokers and grills a step up above the rest of the herd. What is an awesome product without equally incredible accessories? Weber does not disappoint! From utensils to multiple grates to woks to wood chips, the Weber site has everything that any Weber owner would want, and then some! At Grills Forever, we’ve gone through over 8,795 user reviews of different products to determine the important features that we feel our readers need and look for to decide on the product that is right for them. Our team has analyzed over 33 different products, and basically cut 7 our of our top 17 products by visiting websites, going through descriptions on different vendor pages, as well as individual critic reviews to determine the features that these products usually have. Grills Forever has also been fortunate to have a diverse group of volunteers provide feedback on the models listed below after using them. We compared the final reviews of the above-mentioned volunteers and match them against the research data that we accumulated from the web, then analyzed and tested different types of Weber grills to determine our best picks. Taking all of this data we received, we selected the ten best products and are ready to present our verdict, which we give to you, without further ado! We have taken an in-depth look at the features of Weber Smoker and grills that we felt our readers would be most interested in. We also looked for 62 positive features that a Weber smoker or grill could have. Most of these features were taken from the list of features that Weber grills that the products on display at the Weber website, as well as included in their manuals/specification sheets. The rest of the features were ones that hadn’t been mentioned, but are still important for the user to know and have. We’ve also considered the pricing for the products and looked for the ones that provide the best value, aka “the most bang for the buck.” For the record, we’ve also considered the review frequencies of the products to determine and exclude obsolete products for this list so that you, the consumer, are able to find a recent and accurate review for the best products for 2018. Why Is This Product the Best of All the Bullet Smokers Produced by Weber? Grills Forever analyzed 62 features for each of the products that we have selected. But a nice combination of the most essential features, like a built-in thermometer, porcelain-enameled charcoal chamber and water pan, high-temp silicone grommet, and rust-proof aluminum fuel door. This may not be the highest number of features in our list, but it had the highest number of reviews in our list (over 1,930) on Amazon at the time of our research. We’ve had products costing in the range of $39 of $1,299 in our shortlisted candidates, this product came at around $199 which puts it in the lower tier in terms of price. Although this product isn’t the cheapest, it’s the best among the smokers both in terms of price and features. It has the highest rating (an impressive 4.7 stars) of the products in our list on Amazon at the time of our research. It has received 10 reviews within 3 weeks, 20 reviews in less than 11 days, and 30 reviews within 12 days. When considering how many of Weber smokers are usually sold online, this is a very impressive review frequency, showing that they are selling hundreds of grills within 3 weeks. It’s a clear indication of how popular this product is. Because it uses charcoal as fuel, you’ll find that your smoked meat will retain that wonderful taste that you don’t necessarily get from gas/propane. The 14-inch Smokey Mountain Cooker (SMC) is designed in such a way that you can get to what you need without a lot of fuss, and is a perfect match for smaller spaces due to its lid-closed dimensions (in inches) of 31.4 H x 17.7 W x 14.7 D. this model also boasts a sturdy glass-reinforced nylon handle. This model includes air dampers that will make controlling temperature and air-flow easy. A porcelain-enameled water pan and charcoal chamber (for ease of cleaning), rust-resistant aluminum fuel door (because you’ll want to be able to easily add more charcoal or wood chips if you need to without killing the internal temperature) and air dampers that will make controlling temperature and air flow easy. 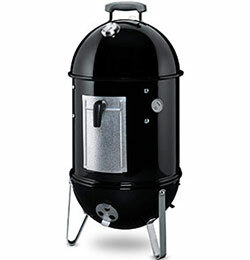 Some of the features that make this a great smoker (especially for beginners) are the built-in, easy-to-read thermometer, high-temp silicone grommet that will allow you to pop a temperature probe into your meat without removing the lid (this helps maintain temperature inside the smoker). The 14” model will cook/smoke two pork butts at the same time, so while it is the smallest of the three models, it’s still generous with a cooking area of 286 square inches. Because it weighs 23 pounds, it boasts some portability, so you can put it in the bed of your truck and take it with you if you need to. Some people might be turned off by the lack of wheels, but because the smoker is stackable, it can be moved in pieces, so don’t let the 23-pound weight put you off. Weber’s warranty is pretty sweet, too! They offer 10 years on the bowl, lid and center ring, 5 years on the plastic components and 2 years on all remaining parts. 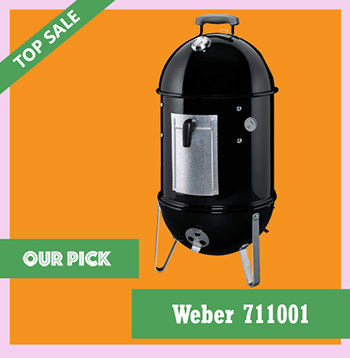 This Weber smoker/cooker comes in two additional sizes; 18 and 22 inches, which each having two heavy-duty plated still cooking grates to double cooking/smoking space, at 481 and 726 square inches, respectively. 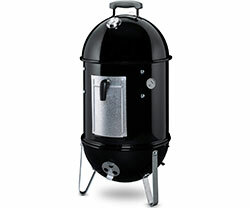 These larger smokers are ideal for anyone that regularly cooks for a crowd. These models weigh 39.1 and 68 pounds, respectively, and aren’t as portable. As a stand-alone smoker/cooker, you can’t go wrong with this model. We feel that the cons can be overcome, given that the model stacks and can be moved in pieces. As for the missing pieces? A phone call to Weber should rectify that. We give it a thumbs up! Why Is This Product the Best of All the Portable Grills Produced by Weber? The Weber Smokey Joe charcoal grill is an ideal portable grill for camping, trips to the beach and tailgating. With its affordability and portability, we don’t think you can go wrong purchasing this product as your go-to, take-along grill, and because it’s charcoal, you’ll have that amazing grill taste in a little package. The other great thing we like about the Smokey Joe is that you can bundle it with different items; the digital thermometer, Lighting Nuggets, grill set or chimney starter. Also, Weber’s Smokey Joe 14” portable grill has 16 positive features, which may not look much when you compare them to the other products on our list, but this one is actually the best out of all of the portable grills that Grills Forever researched! To make this terrific little Weber smoker even better? 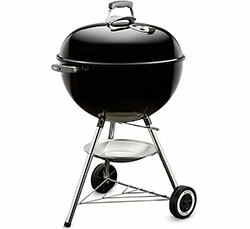 The price tag; it comes in at the lowest price, around $40, which is a terrific price for a brand name like Weber! It also has the highest rating of 4.7 stars in our list of products on Amazon at the time of our research. We can safely call this easy-to-use portable grill the most popular product among its many users. In fact, while checking out the resources available to us during our research, “Brand Name” was one of the repeating themes when scrolling through the various reviews that we looked at. It also has the second highest number of reviews in our list, with over 1,182 on Amazon at the time of our research. The Smokey Joe has been receiving 10 reviews in 1 week, 20 reviews in less than 12 days, and 30 reviews within 12 days. When considering how many of Weber smokers are usually sold online, this is a very impressive review frequency, which again shows us that Weber is selling hundreds of grills on Amazon in less than 12 days. The design of the Smokey Joe is fashioned in true, old-school Weber kettle-style, but with more portability than its bigger brothers. With the lid closed, the dimensions are as follows (in inches): 17” H x 14.2 W x 14.5” D, and a 14” diameter. The 147 square inch cooking surface, by way of the plated steel cooking grate can accommodate up to three steaks or six burgers. The charcoal grate is heavy-gauge steel, and the lid and bowl are both porcelain-enameled, and the lid is equipped with a glass-reinforced nylon handle. Some of the reasons that make the Smokey Joe a great little Weber smoker include the aluminum ash catcher, rust resistance (for years of continued use), and with this package, an instant-read digital thermometer. Anyone that’s ever pulled a steak off the grill and found it over-done will love this instant-read internal temperature thermometer. You can also add on the optional One Touch Cleaning System. The top handle is made of glass-reinforced nylon, so it won’t burn your hands. The One-Touch cleaning system makes for super-easy ash removal from the bowl. Some of the other factors that you may be looking at include the price and reviews/review frequency (as we mentioned earlier), as well as the warranty. For a portable grill under $50.00, the warranty is very respectable. Weber offers 10 years on the bowl and lid, 5 years on the One-Touch Cleaning System and plastic components, 5 years and 2 years on all other parts. Not too shabby, no? This model gets a thumbs up from us due to the ease of use, portability and price-point. While it isn’t going to cook for a crowd, it is the perfect grill for a small family. Again, the missing pieces issue can be rectified by a quick call to Weber. Why Is This Product the Best of All the Gas Grills Produced by Weber? 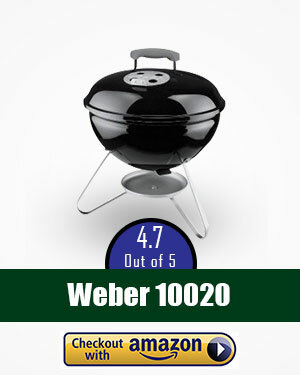 The price of the Weber Q1200 liquid propane grill is around $200, which is on the lower end of the price range of $40 to $1300 that represent the makes and models on our list and while it is the fourth highest-priced in our list? We have found that this grill is priced appropriately, as its cost is well within the average range for gas grills of the same size and stature. The Q1200’s price is the second lowest among the gas products in our list. We, at Grills Forever, found it possesses 18 positive features, which is a really respectable number when you compare it to its competitors. It has a good number of reviews (around 830) and highest rating 4.7 stars in our list on Amazon at the time of our research (which ties with the Smokey Mountain Cooker and the Smokey Joe portable). It has been receiving 10 reviews in less than 12 days, 20 reviews within 1 week and 30 reviews less than 4 days that indicates the popularity of this product and how frequently it is being sold. 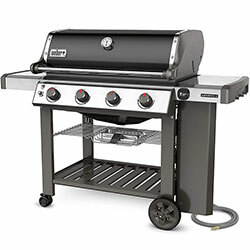 It has an easy-start electronic ignition (which, if you’ve ever struggled to light a gas grill, you will find important) and infinite control burner valve settings make this much more unique than comparable other products. 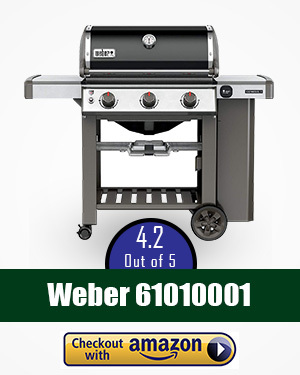 All of the above combined make the Weber Q1200 the best gas grill among all the other Weber gas-option offerings. Did we mention the colors? Yes, the Q1200 comes in the following colors: titanium, black, green, blue, orange, purple, red and Fuchsia. Other models in the Q Series include 1000, 2000, 2200 and 3200. The 3200 series comes in LP and natural gas options. 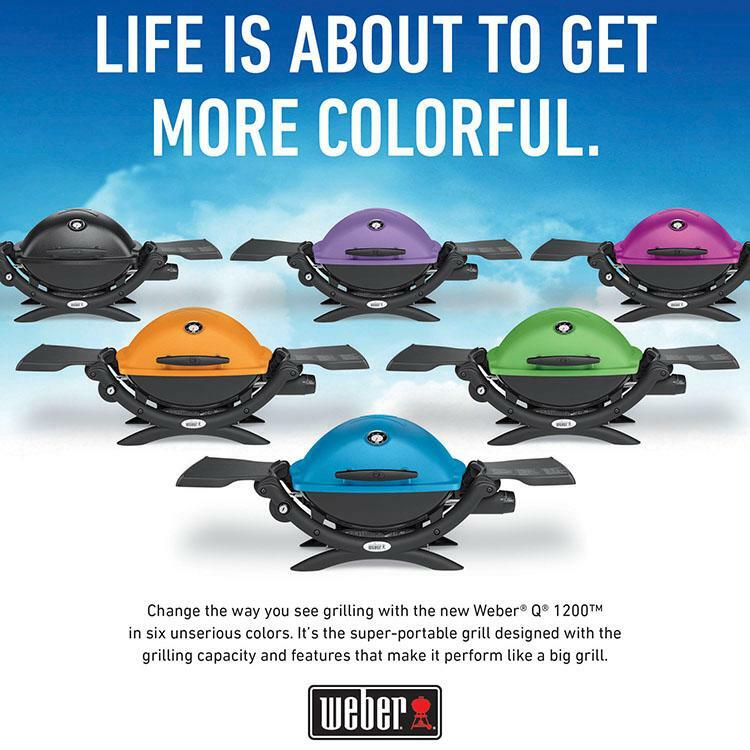 The Weber Q1200 was designed to make your LP cooking experience really easy, portable and, well, color coordinated. 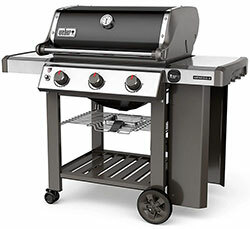 As we mentioned above, the Q1200 comes in eight fashion colors, and while that’s nice, what we really liked about the Q1200 are the fairly compact dimensions (in inches): 24.6” H x 40.9” @ x 20.5” D, as opposed to a lot of other gas grills. The cooking area is 189 square inches, the cooking grates are porcelain-enameled cast iron, so this is a plus for anyone that’s ever really enjoyed cooking something in a cast iron frying pan. The lid and body are made of cast aluminum. The shipping weight is listed at 29.5 pounds, and this is classified as a table-top grill. You can use 16.4 ounce LP canisters or add an adapter hose for a regular-sized 20 gallon LP tank. 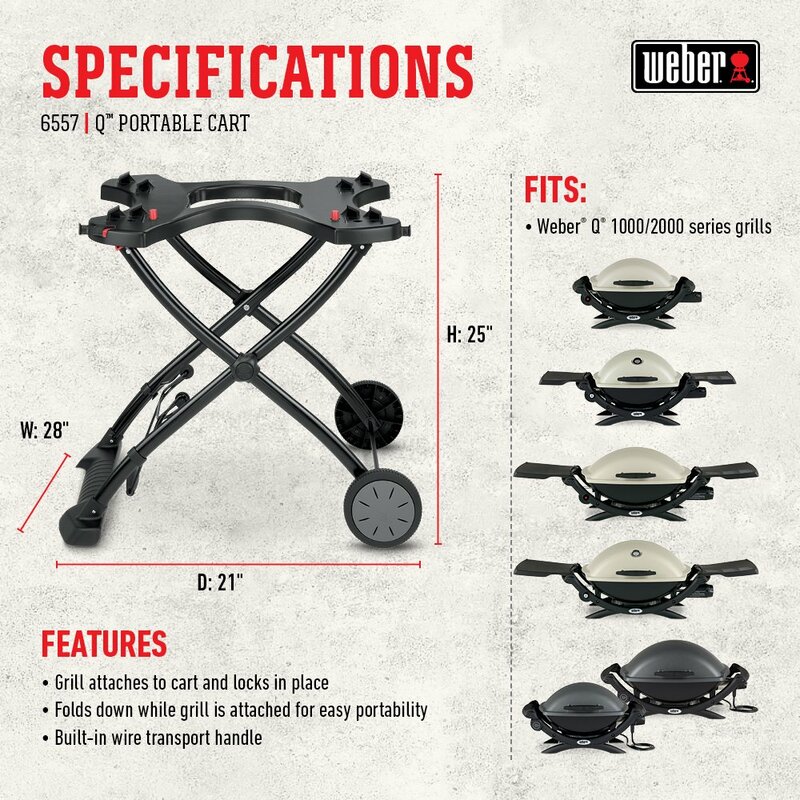 While it’s a table-top model, you can also purchase the Weber 6557 portable cart which has wheels. As for ease of use and features? Where do we start? The Q1200 has an electronic ignition that requires one AAA battery, the Infinate Control burner valve (for making temperature control a snap), folding side tables and a built-in lid-thermometer. Let’s not forget the removable catch pan. One of our favorite features is the fold-out tables; one on either side of the cooking surface. These are great for placing plates and utensils, as well as a little extra workspace if you’re not using this grill on a table top. One of the best conveniences of this particular model is that it comes fully assembled. Yes! Absolutely and totally assembled. The warranty is nothing to shake a stick at, either. Weber warrants 5 years on the cookbox and lid assembly (2 years on the paint), 5 years on the stainless steel burner tubes and porcelain-enameled cast iron cooking grates and plastic components, and 2 years on all remaining parts. The reviews on this grill are pretty impressive as well. As mentioned above, the average Amazon review is 4.7 stars. We took it a step further and checked out the reviews on the Weber site, and we found that 4.7 stars is also the average there. Across the board, consumers would definitely recommend this product to a friend. This is our favorite of all the LP models we looked at/reviewed. We love that it comes pre-assembled, offers a choice of colors that gives the end user options to match whatever theme they might have going on in their backyard, and the Infinite Control Burner Valve. While we aren’t loving that the adapter hose is an additional purchase for those that prefer the standard 20 pound LP cylinders, it isn’t a deal breaker for us, so we give this model a thumbs up! Why Is This Product the Best of All the Charcoal Grills Produced by Weber? Ahhh, the original Weber Premium Charcoal Kettle Grill; How do we love thee? Let us count the ways! This iconic piece of grilling history has made our Grills Forever Top Ten List, and with good reason! The price of this grill is around $150 and features like One-Touch cleaning system, porcelain-enameled lid bowl, plated steel hinged cooking grate, rust-proof aluminum damper and a lot more make it a feature-rich product. This is the highest number of positive features in our list and very reasonable if we compare it with the prices and features of other comparable products. 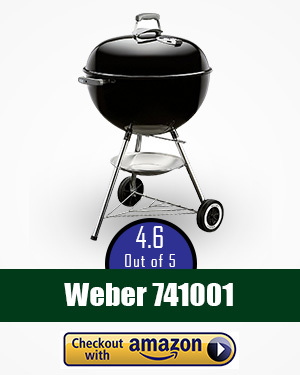 Apart from that, the Weber Original Kettle Premium Charcoal Grill has the second highest rating of 4.6 stars and third highest number of reviews (over 1,047) in our list on Amazon at the time of our research. 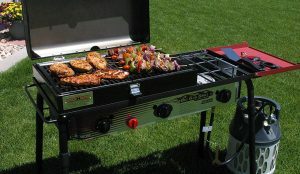 This grill has received 10 reviews in less than 18 days, 20 reviews within 1 week and 30 reviews in less than 6 days, which indicates it’s been sold frequently. Although our top pick also a uses charcoal as its fuel source, this kettle grill is vastly different from a bullet smoker, and thus falls into its own category of charcoal – kettle grill. This is not a smoker, but you can smoke on this kettle grill! Hang in there, and we’ll show you how, because, yes! This is a very versatile piece of grilling equipment! With a cooking surface area of 363 square inches, you can throw a lot of food on it and feed a decent-sized crowd. This grill comes in a few different finishes; black, copper and green. Its weight is listed at 32.3 pounds, but because of the all-weather wheels, it can be easily rolled from sun to shade. Ready for our review? We thought you might be. The Original Kettle Premium Charcoal Grill, 22-Inch was designed for a variety of grilling/smoking tasks. The bowl and lid, of course, are made of porcelain-enamel, which we’ve found is a common denominator in Weber’s charcoal grills. This particular 22” model has a total cooking area of 363 square inches, which gives a griller a lot of room for meats and even veggies! This is a super easy-to-use model and the features we like include the removable aluminum ash catcher, standard One Touch Cleaning System, spring clip/push pin leg assembly, the lid hook inside the grill lid (because who doesn’t want somewhere to place a hot lid?). The built-in lid thermometer is also a plus! Because this model’s fuel source is charcoal, there is going to be that wonderful taste to anything thrown onto the plated steel cooking grate. The charcoal grate is made of heavy-gauge steel. This model comes with two durable all-weather wheels to make wheeling this grill from direct sun to a more shaded area an easy transition. Like the other charcoal models we’ve looked at, the Original Kettle Premium Charcoal Grill’s handles are made of glass-reinforced nylon. The One-Touch cleaning system makes ash removal as easy as pie. You can see how this would be a cost-effective way to do grilling and smoking! The reviews on this particular grill are pretty impressive. 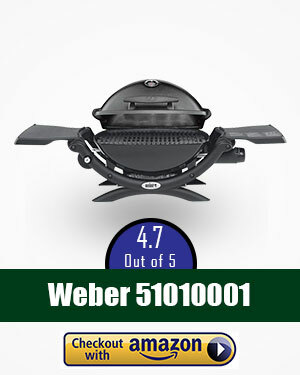 On the Weber site, this grill scores 4.8 stars, and as mentioned, earlier, Amazon’s overall score is 4.6 stars. Again? Weber’s warranty is really impressive! 10 years on the bowl and lid, 5 years on the One-Touch Cleaning System and plastic components and 2 years on remaining parts. 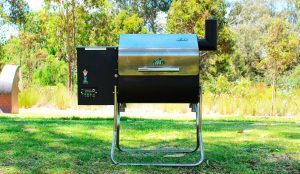 This model gets a thumbs up from us because we love the classic kettle style, that it can be used as both a grill and a smoker, and the addition of the ash catcher on the bottom that will keep hot ash off of whatever surface you are grilling on. This model is a little more expensive than some of the other options we’ve tested, but you get a lot for your buck. Assembly is easy, the wheels and useful and it cooks your food well and evenly. 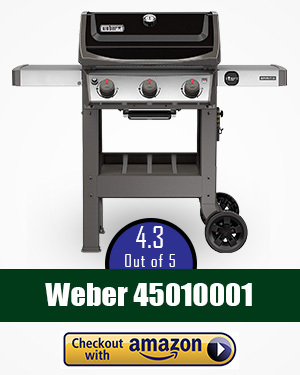 The price of the Weber Spirit II E-310 Gas grill (liquid propane) is around $499, which is the third highest priced on the price range of $39 to $1299 that represent the makes and models on our list and while it is the third highest-priced in our list? We have found that this grill is priced appropriately, as its cost is well within the average range for gas grills of the same size. Grills Forever has found that the Spirit II E-310 possesses 20 positive features, which is also a pretty good number when you compare it to its competitors. It has a good number of reviews (around 141) and a rating of 4.3 stars in our list on Amazon at the time of our research. Forty-one (41) of those reviews came in within the last thirty days. This model has the GS-4 Grilling System, which is composed of four key elements: Infinity Ignition, three powerful burners, Flavorizer Bars and grease management. The Infinity Ignition is guaranteed to ignite each time, and has a 10-year warranty. The burner tubes provide a consistent gas flow, which cooks evenly. While “Flavorizer Bars” are a new thing to us, we’ve found that these bars are angled to catch drippings that smoke, which ad an irresistible charcoal-like flavor to what we are grilling at that time. This unit also comes with porcelain-enameled cast iron cooking grates, an open cart design and a side-table to create more workspace. This bad boy weighs in at 114 pounds! So with these benefits in mind, let’s look at our review, shall we? The Spirit II E-310 Gas grill has been designed to have an impressive 424 square inch cooking surface, using porcelain-enameled cast-iron cooking grates. 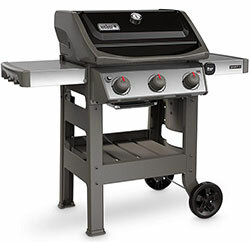 This grill isn’t compact, with lid-closed dimensions (in inches) of 44.5”H x 52:W x 27”D. It comes with a porcelain-enameled lid, as well, for longevity, and the flavorizer bars are also porcelain-enameled. The fuel-type, as mentioned above is Liquid Propane (LP) in 20 lb. tanks. This model also boasts three stainless steel burners. Things we love include a 105 square inch warming surface, as well as a built-in lid thermometer, fold-down left-side table, fuel gauge for LP models, and 1 AA battery requirement for the igniter. There are also color options! Access to grilling tools is a no-brainer with the hooks available. This model also comes with a heat deflector. The reviews on this grill are incredibly favorable, and the price-point for what you get is really impressive. As with all the Weber warranties, while generous? The one for this model covers ALL parts for 10 years! This added bit of insurance will give you the added assurance that your meat is done to the desired doneness, because who loves an overdone steak? While this model can be a little spendy, we appreciate the warranty and all of the features that it comes with. The addition of an iGrill 3 ices our tech-loving cake as well. As with all of the common complaints across most models, if the unit is damaged, a call to Weber should fix that. We give it a thumbs up! This model is far from our favorite. Although it has some great elements, like its portability, heat controls and space to cook for four, you don’t get much else for your money. 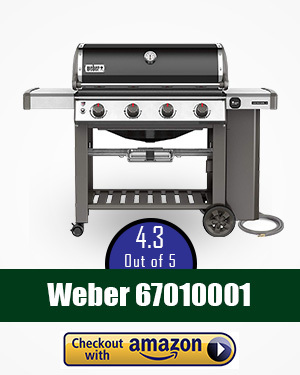 When you look at the Weber Q1000 LP grill, you may feel a sense of deja-vu. That’s because outwardly, the Q1000 looks a lot like it’s bigger sibling, the Q1200. 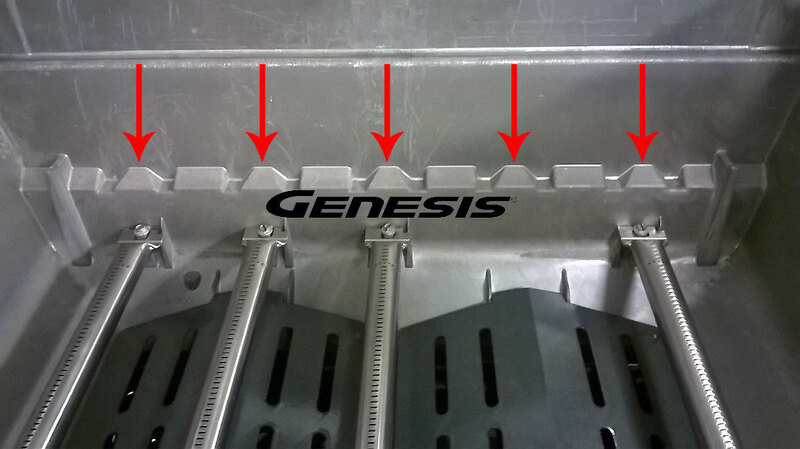 The burner is “D” shaped for optimum performance and the grates have a built-in burner guard. With its lid-open dimensions (in inches) at 23.5”H x 27”W x 20.5”D, you can see how you can put it in the trunk of your compact car and take off on an adventure with room to spare for your cooler. This model boasts one 8,500 BTU stainless steel burner, porcelain-enameled, cast iron cooking grates (that give you 189 square inches of cooking surface), and cast aluminum lid and body. What we love about this model is the push button ignition, Infinite Control burner valve and the removable catch pan. An optional adapter hose can be used to graduate from the little one pound LP bottles to a full-sized 20 pound tank, which is good for backyard grilling, and when placed on a table or cart, the fold-out table on the Q1000’s larger sibling isn’t missed at all. When bundled with the Weber digital thermometer, finding the best serving temperature for your proteins is easy. At the time of this writing, the Q1000 can be purchased on Amazon bundled with the Weber digital thermometer, which we mentioned earlier. This model has 585 reviews on Amazon and has 4.7 stars. It’s received 8 reviews in the past 18 days. At $169.00, this portable and affordable LP gas grill may be just what the doctor ordered! 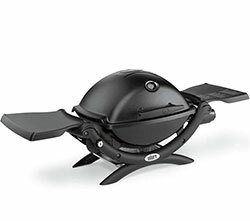 The portability of this little grill makes gas grilling on the go quick and painless. 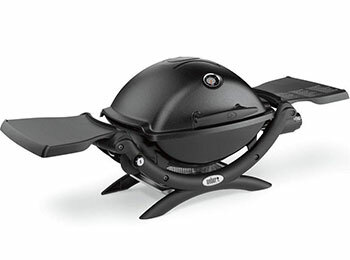 This is a great little Weber that comes with a terrific warranty! 5 years on the cookbox (2 years on paint) and the stainless steel burner tube, porcelain-enameled cast iron cooking grates and plastic components. Weber warranties let you rest assured that you get many seasons of use out of your purchase, from the lower-priced models on up. We don’t like to rain on anyone’s parade, but we have to give this model a thumbs down. While it does have some nice features, we feel that we’d get more bang for our buck by spending the additional $30 or so to get the upgraded 1200 model. This grill cooks well and is efficient. On the downside you do need assemble some parts yourself, but the large cooking space, digital controls and porcelain coated racks more than make up for that. As with all of the Weber models Grills Forever looked at, the Go-Anywhere charcoal grill was designed with ease of use in mind. Both the base and lid are porcelain-enameled, the 160 square inch cooking area is plated steel and there is that always-welcome lid hook inside the grill lid. The charcoal grate is made of heavy-gauge steel. The three handles are glass-reinforced nylon and the 4 dampers are made out of rust-resistant aluminum. This is an easy-to-use charcoal-fueled grill that is also easy to set up. Three words: portability, portability, portability. For those who like to travel (think RV, fifth-wheel and camper), Weber’s Go-Anywhere charcoal grill may be just what you’re looking for. 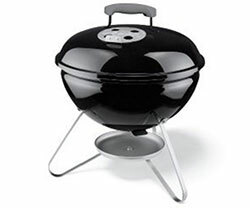 With a $49.99 price tag, one will get a lot of tasty, good times with this Weber model for the price. Some other factors to keep in mind? 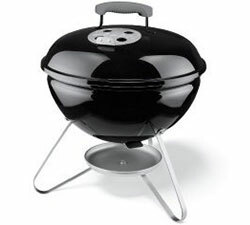 With 839 customer reviews on Amazon, this portable charcoal grill holds a 4.6-star review. Because it uses charcoal as its fuel source, you know that the flavor, from hot dogs to steaks, will be just what you’re looking for! As with Weber’s other products, this particular model has a great warranty. 10 years on the cook box and lid assembly, 5 years on plastic components and 2 years on all other parts. This model gets a thumbs up from us simply because it is really self-contained and doesn’t have to be moved in pieces (i.e. someone carries the bowl, someone else carries the lid). That it is charcoal-fueled is another plus. We don’t think you can go wrong with this grill, given it’s lower cost. This model is a strong option when it comes to the top 10. It is versatile, gives out a good even heat level, and is overall really worth the price. The tool hooks and extras also make it really convenient. 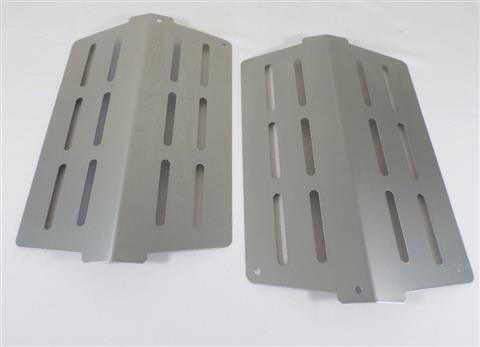 This model includes a porcelain-enameled and cast iron cored cooking grates that give you 513 sq. in. of primary cooking space, with an additional 156 sq. in. Tuck-Away overhead warming rack, which comes in handy when your corn is done and your meat isn’t. (Rookie mistake, but it happens to all of us at one time or another.) This brings the total cooking area to 669 square inches, which is really generous! The lid is also porcelain-enameled. The Infinite Control burner valves make keeping temps consistent really easy, and this model is also compatible with the iGrill 3 for those of us who like this technology. Be sure to check out the aforementioned video for more information on the iGrill 3 and how it can work with your smart-device to probe several cuts of meat simultaneously to get the perfect serving temperature. 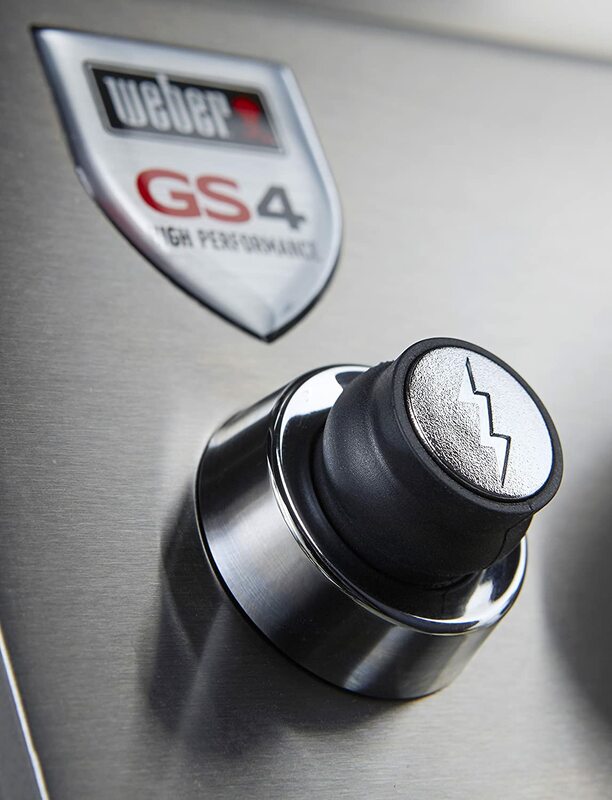 While very similar to the Weber Spirit II Series, the Genesis II E-310 also boasts the GS4 Grilling System and includes three high-performance burners and Flavorizer bars, and a grease management system, but has some additional features. The features of this model are numerous; this model comes with four tool hooks, two wheels for limited portability (moving from shade to sun, for example), a built-in lid thermometer, a 45” wide fold-down side table, the always nice open cart design, an LP fuel gauge, bottom shelf and stainless steel heat deflectors (which make us wonder if we are cooking or re-entering the atmosphere). 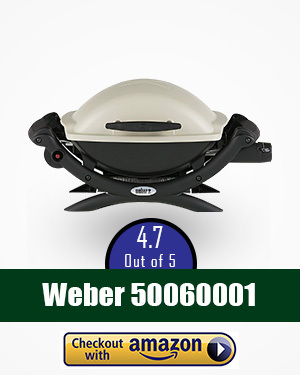 There are 165 Amazon reviews on this Weber product, with the average being 4.2 out of 5 stars, which isn’t shabby at all. Another amazing Weber warranty covers ALL parts for ten years! As LP grills go, we think this one is a winner, as well. The conveniences that we love are the tool hooks, the fold-out table and the ability to move it around. We also love the warranty. This model gets a thumbs up from us. This model may put some people off because of its high price for an easy home grill. However it has some great specs. It is well built and cooks evenly, and comes with a warranty to keep you reassured. This model comes with porcelain-enameled Flavorizer bars, a primary cooking area of 646 square inches and a tuck-away warming rack of 198 square inches, for a total cooking area of 844 square inches. The lid is also porcelain-enameled. This unit’s dimensions, with the lid open (in inches) are 61”H x 61”W x 31”D. The Infinity Control burner valves make keeping a consistent temperature easy. This model is also compatible with the iGrill 3 for those of us that want to connect with our inner-tech-geek while cooking, to ensure the best possible serving temperature. Some of our favorite features include the built-in lid thermometer, stainless steel side-tables, open cart design, welded tube frame, and bottom shelf. Infinity ignition. This is guaranteed to light each and every time. Although the Genesis II E-410 Natural gas grill comes with the features that the LP E-310 does, but it also comes with a price tag of $899.00. This grill has received 161 customer reviews on Amazon with an average rating of 4.3 stars. Like all of the Weber smoker, cookers and grills, the Genesis II E-410 is also designed for ease of use. 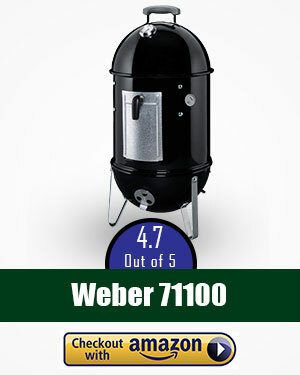 Along with all the bells and whistles that come with this Weber smoker model, there is also one of the best warranties out there: 10 years (excluding normal wear an tear and subject to additional terms and conditions in the warranty. While the features on this model are wonderful, we feel that the price point it can be off-putting to the casual home griller. If the end-user has a natural gas line and has the disposable income to invest in this model, then this would be a great choice. We have to give this one a thumbs down. This model gives a lot for a small budget. It isn’t made cheaply, is fine to use for beginners and is great value for money overall. You get great flavor from this model so will be cooking on it all the time! The Weber Original 22 inch smoker/grill offers the following in classic design and ease of use: that traditional lid and bowl that are porcelain-enameled, a 363 square inch cook surface and charcoal fuel for great post-grilling flavor. The lid-closed dimensions as follows (in inches): 39.5”H x 22.5”W x 27”D. It has a plated steel cooking grate and heavy-gauge steel charcoal grate. The model does have the One-Touch cleaning system, but does not have the removable aluminum ash catcher that the premium edition does. For precision heat control, the aluminum damper is just the thing and it is rust-resistant, which will ensure your Weber smoker/cooker will be around for many grilling seasons. This model comes with a bottom wire rack and a lid hook inside the grill lid and spring clip/push pin leg assembly. The bowl and grates withstand high temperatures and is ideal for both direct and indirect cooking methods. Because the grill is airtight with the vents closed, it allows for the recycling of charcoal, which is helpful if you are on a budget. This model has two (2) glass-reinforced nylon handles, and two (2) all-weather wheels for portability. Like the higher-priced models, smoking can be done with this kettle, as well. The reviews on this model are good, as well; 923 customer reviews and 4.6 out of 5 stars. 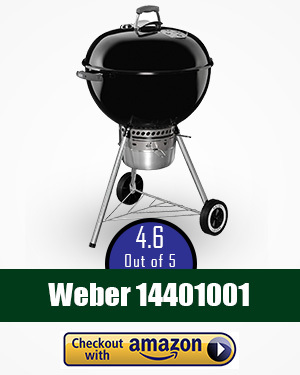 Like all the other products we’ve looked at, Weber provides a great warranty for this model. 10 years on the bowl and lid, 5 years on the One-Touch Cleaning System and plastic components 5 years and 2 years on all other parts. We give this model a thumbs up because it gives the budget-conscious consumer a 22-inch kettle option for people that don’t need the bells and whistles on the premium model. We also like the warranty. The way the grill is lit. In charcoal grills your lighter is the ignition, but in gas grills, there are two types of ignition; piezo ignition and battery spark generator. 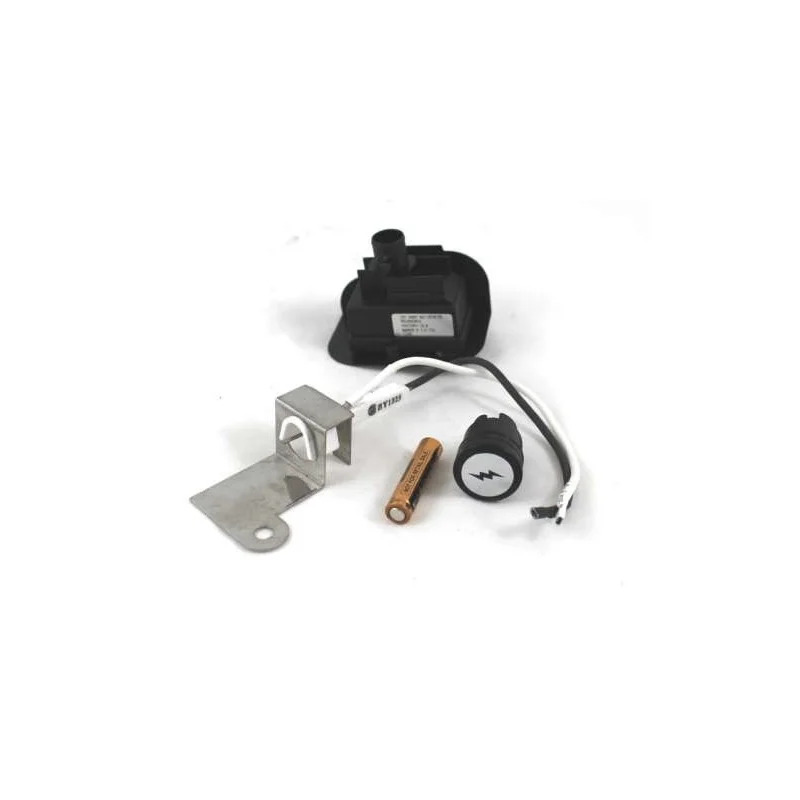 Piezo ignition works by turning on the gas, and pressing a button. The electronic ignition creates a spark and thus lights the gas, creating flames. A battery spark generator uses voltage from a battery to generate the spark. LP stands for liquid propane so an LP cylinder is the container that the propane is stored in. These can be as small as 1 pound cylinders to the still portable 20 pound cylinder, which is what most people are used to seeing. The area where numbers (or letters) shown on a digital thermometer. Using a digital thermometer, you would place the probe into the meat and the numbers you see are being shown on the digital display. The iGrill 3 is a perfect example of a digital Bluetooth thermometer. When paired with your mobile device the app shows real-time temperature that is obtained by a probe in the meat, which runs to the iGrill 3 device, and then is transmitted to your device. As you can see, Weber has a product for anyone that wants to make grilling their food a part of their lifestyle. From super-portable gas and charcoal options to larger, more static products, we think Weber has a product just right for you. Grilling and smoking can (and does) bring pleasure and a terrific aroma to any outdoor gathering, and many people enjoy grilling all year ‘round. Nothing tastes or smells quite as good as a steak fresh off the grill in the middle of a cold snap! While the overall pros were varied, the cons showed some common threads: missing parts and/or damage upon delivery. These issues can easily be cleared up by contacting Weber. Please note: not all types of grills are suitable for everyone. Take into consideration your location (are you in an apartment that does not allow open flame on the balcony? ), personal situation, menu options and flavor choices (e.g. gas grills will not render the same flavor as charcoal grills). The care and maintenance of your new Weber smoker is important in maintaining its lifespan, very similar to getting your car tuned up. Wipe down exterior surfaces after cool-down. If your model has an ash catcher, be aware of how full it gets, making sure that all ash is cool when you dispose of it. Check ash levels prior to lighting your grill to ensure you don’t have to try and empty a hot ash catcher. If your model has a grease catcher, empty that when needed, prior to igniting your grill. Too much grease around that much heat is a fire hazard. Once your model has heated enough to start grilling, take a good grill brush to the cooking surface to remove any remaining bits left from the previous cook. Invest in a good grill cover to keep your grill sheltered from the elements, and do ensure that the cover is the correct size for your model. If it’s too large, a good breeze will lift it and send it flying across the yard. If it’s too small, there may be some parts exposed that you want covered. If your product comes with a battery-powered spark generator, ensure that your batteries are fresh and check that batteries aren’t corroded after a winter of non-use. It should go without saying, but we are going to say it, anyway; keep fire safety at the front of your mind. We had a neighbor once who decided it would be smart to charcoal grill on the covered front porch. Needless to say, they were replacing some vinyl. If you charcoal grill on an old wood deck, think about moving your grill to something that an errant spark won’t hurt, like a concrete patio pad, or even the lawn. Nothing ruins a good get-together like a deck on fire. At Grills Forever, we care about your safety! 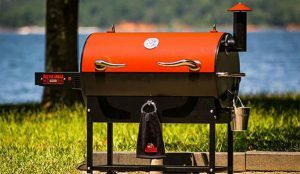 There are a LOT of Weber models to consider, and Grills Forever has narrowed the field down to ten of our favorites. Now that you’ve read our Best Weber Grills of 2018 – Reviews and Buyers Guide, we hope that you aren’t feeling as overwhelmed as you might have been, had you just started clicking through to the various grills. Whether you prefer charcoal or gas, we at Grills Forever hope that we’ve taken some of the guesswork out of it for you. Of course, doing your own research is recommended, but we hope that our picks will give you a good starting point. As you can see, we’ve done a lot of research on selecting our top ten Weber smoker picks. Whether you are brand new to the grilling scene, ready to explore smoking your proteins or are a seasoned griller, we hope that you found something of value in our report because we understand that as a consumer, you have an incredible amount of products to pick from. Our goal at Grills Forever is to help you find a product that will bring you many seasons of enjoyment, many delicious meals to your table and many happy memories to look back on!